The 17th century in France saw the creation of the Royal Academy of Painting and Sculpture, an institution that was to dominate artistic production for nearly 200 years. Founded in 1648 during the reign of Louis XIV and modeled on the Accademia di San Luca in Rome, the Royal Academy was intended to professionalize artists working for the French court. Some 35 years later, the organization reached its full glory under the leadership of the history painter Charles Le Brun (French, 1619 - 1690), who gave precedence to painters of history or mythology followed by those painting portraits, genre scenes, landscapes, animals, and lastly, still lifes. Le Brun also instituted a regimented system of artistic training that promoted the teaching of perspective and draftsmanship and thus corresponded closely with the ideals upheld by the classicist Nicolas Poussin (French, 1594 - 1665). The death of Louis XIV in 1715 marked the debut of a seven-year period of social license during which France was governed by the hedonistic Philippe d’Orléans, acting as regent for the young Louis XV. This shift set the tone for artistic practice throughout the 18th century, as collecting tastes turned toward what is now known as the rococo manner, characterized by the gallant mythological scenes of Jean François de Troy (French, 1679 - 1752), the fêtes galantes of Antoine Watteau (French, 1684 - 1721) and Nicolas Lancret (French, 1690 - 1743), and the lush pastorals of François Boucher (French, 1703 - 1770). Nonetheless, the Royal Academy continued to dominate the French art world. All of the above artists were members, and Boucher, named “First Painter to the King” in 1765, held key official positions within the Academy. Two important artistic developments arose in the course of the 18th century. First, Enlightenment philosophy, with its empirical bent, encouraged a corresponding attention to realism in art, as shown in the work of Jean Siméon Chardin (French, 1699 - 1779), a renowned still-life painter. Second, in the latter part of the century neoclassicism led to the revival of interest in the subjects and aesthetic of classical antiquity: namely, a renewed insistence on moralizing historical themes and a subdued, highly linear idiom. The movement’s popularity in France was spurred by ongoing archaeological investigations—in Pompeii, for example—and found artistic expression in the architectural fantasies of Hubert Robert (French, 1733 - 1808). 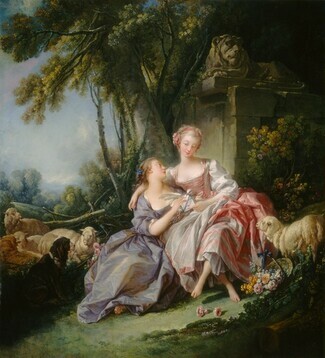 The sobriety of neoclassical art is typically considered in opposition to the exuberance of the rococo, but artists such as Jean-Baptiste Greuze (French, 1725 - 1805) practiced in both styles. The two movements were thus not decidedly oppositional. This is particularly true of Jacques-Louis David (French, 1748 - 1825), whose early work demonstrates the influence of his first teacher, Boucher, while the neoclassical history paintings of the 1780s for which he is best known are clearly inspired by the friezelike compositions of Poussin and his classical antecedents. David’s politically charged works reflected increasing public dissatisfaction with the French monarchy and a desire for the introduction of republican principles. An ardent supporter of the Revolution, David was instrumental in dismantling ancien régime systems, including the Royal Academy, which was dissolved by the National Convention on August 8, 1793, in a move that definitively changed future artistic production in France.